Entering the Through Arts Keep Smiling (TAKS) center in Gulu, one is immediately struck by the attractions. It is a thoughtful location for the Bayimba northern regional festival of the arts. An ample green lawn played host for two days, stretching forth encircled by wood and papyrus. The days were filled with exhibitions, ranging from crafts to visual art, workshops, and a stage to showcase music fashion and fire dancing. The walls, seen from outside the TAKS center building give a hint, a benchmark, of how ‘talking arts keep people smiling’. 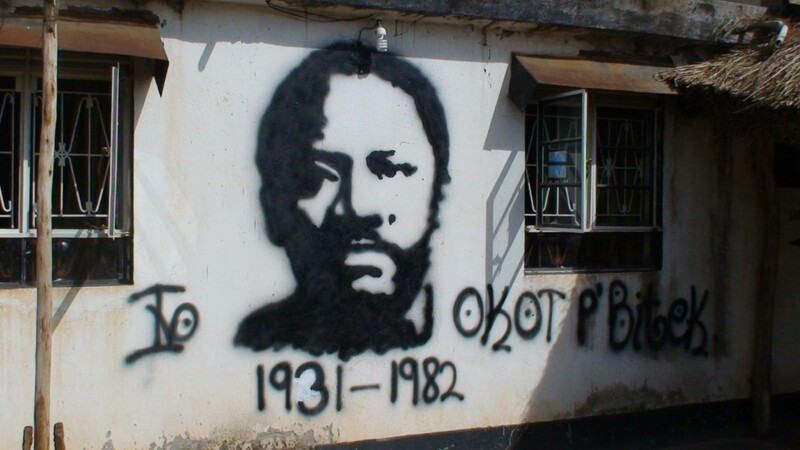 Floor to roof portraits of Nelson Mandela, Bob Marley, Dr. Matthew Lukwiya and Okot P’Bitek have been graffitied on the concrete. The latter two celebrated sons of the Luo origin. In 1989, Dr Matthew Lukwiya bartered himself for several Italian nuns whom the rebels had come to abduct at St. Mary’s Hospital Lacor and was released after a week of wandering the bushes. He would later succumb to the Ebola outbreak in Gulu in 2000 after overseeing great efforts to contain the virus. Okot p’Bitek, the poet, aesthete and philosopher championed indigenous expression of art and gave us Song of Lawino to demonstrate his point. The point of artist ‘Issac’ is to show the portraits of visionaries who challenged humanity to rethink its actions; to progress to better conditions of existence. The TAKS centre serving now as a symbol of restoration, snuggles right behind the Acoli Inn, another famous hub in the region. Commissioned by the colonial government in 1936, it served as a meeting place for a large portion of human machinery of the Kony war: military officials, politicians, journalists, NGOs and expatriates, who resided there deliberating war. But its reputation extends further back and presidents, past and current, have frequented the area. The TAKS centre behind it, sits on land that was previously a colonial Golf Club now turned into a community arts centre by founder-siblings, David Odwar and Joyce Laker. The Maisha Film Lab workshop took place on Friday, facilitated by Gloria Kiconco. It involved showing two local short films to about thirty filmmakers in the TAKS hall. The films were then discussed with the participants revealing which aspects of the films had interested the film makers most. Most of the responses revolved around character and plot, that Kiconco gathered to frame a discussion around storytelling, character and conflict as devices for filmmaking. The filmmakers were urged to tell the story that they were most conversant with, to create complex and interesting characters, and to develop engaging tensions by furnishing their protagonists with vulnerabilities. However, for film in Gulu, infrastructural challenges still abound. David Odwar, a sculptor, film enthusiast and founder of the TAKS centre said, “When I speak to them [film makers], they tell me they have no office, no laptop.” As a medium which constantly updates itself with increased technological awareness and availability of resources, film has been slow to catch on; a challenge elaborated by the fact that Gulu has been marred by war which disabled all form of growth. Nevertheless filmmakers were told that, in light of the logistical challenges, to work with what they have — to start with any available camera after all, it’s not about the camera but its holder. Odwar would later ask Maisha, “Can you at least come twice a year?” And that is where one thinks Maisha Film Lab was, and should continue to be useful. Judging from the numbers and discussion in the hall, there is an interest in film but we still await some notable work. The promise from Maisha to the film makers to correspond, to share resources, opportunities and more workshops might remedy that. Simultaneously a visual arts workshop organised by KLA ART 014 took place in the lawn of TAKS Centre. Art critic, Moses Serubiri who was one of the facilitators of the workshop explained the idea of the workshop which involved asking the artists to make sketches spanning a varied thematic breadth aiming at expressing something symbolic in from where they hail. Looking at the work, there seemed to be a bias to the theme of migration. One painting was the map of Uganda carved out in colours to reveal a luggage-laden woman with a child moving towards the East. 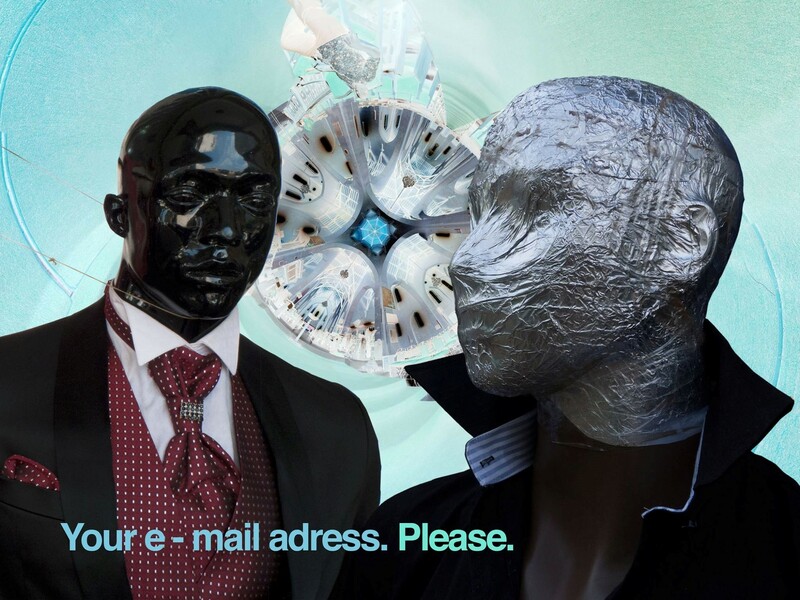 It contemplates the idea of boundaries as instituted by colonialism: the random carving of territories for trade with no attention to the vulnerability of ethnic identities that gives us the contemporary classification of Luo as the Kenyan Luo of Ugandan Luo. The KLA ART 014 workshop also attempted to create an interaction between the art and festival goers. Edward Wadimbwa one of the facilitators from Uganda Visual Arts and Designers Association (UVADA), carved a fish by cutting and gluing worn out cushions. Jarvic Rafols, a Filipino visual artist working in Gulu then cut strips of printed cloth and glued them to complete the skin. 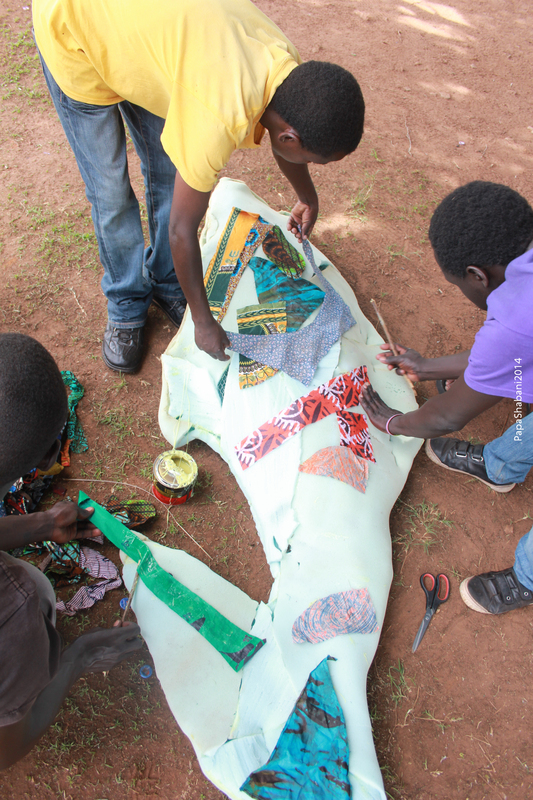 Laura Ratling, the coordinator from KLA ART 014 invited festival goers to stitch pieces of the print onto the fish. At one point festival police officials worked at it, at another it was a group of boda boda riders. Many festival goers also stopped to view exhibition by Benjamin Swatez, a travelling artist who claims he comes from “everywhere” but currently moves between Pader and Lira. The exhibition showcased printed reproductions of his work. He uses art as therapy in areas of conflict which took him to Bahari, India on Free the Slaves campaign creating art therapy projects. Last year he taught at an art therapy center, specialising in children marginalised by conflict in Goma, DR Congo. The nature of Benjamin Swatez’s themes implies a transcendence of context. One wonders whether the people in Gulu who stalked and stared at the exhibition carried away its intent. Benjamin Swatez showing his depth in the catalogue of arts later performed a fire dancing act alongside a travelling colleague George David Ford. Swatez, with a chain in each hand and Ford with a baton twirled and waved their flaming tools to a varied reaction from the audience. More energetic twirls of the chains and baton painted arcs of sparks in the air. There were murmurs of anxiety from the crowd, followed by general gasps of breath as they watched to see each time that the performers had momentarily withdrawn unscathed. It is self-testing, but for Benjamin Swatez freedom is at the very heart of the demonstration. 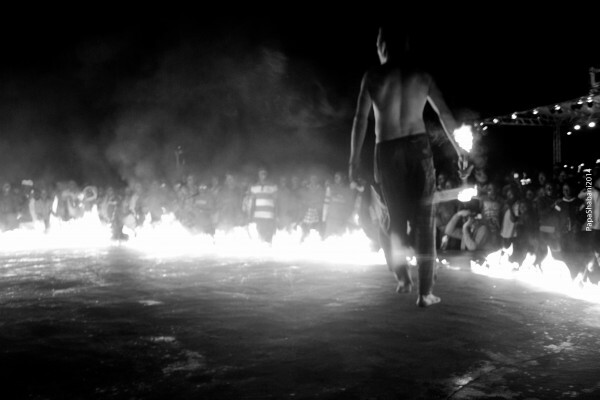 He said, “Walking the tight rope of fire, you will notice that one can be able to choose freedom and liberty all the time.” Benjamin Swatez thinks that fire-dancing is one of the ways that can communicate this duality successfully and stresses that challenges can be transformed into opportunity. “How do we develop a medium of channelling good and bad as a positive outlet? Art brings one to the state of being complete with oneself, a freedom to share.” This desire to share must have been well received, for after the performance most of the festival goers continued to stand around the scene, perhaps entranced, only to be lured back to the stage by the MC. 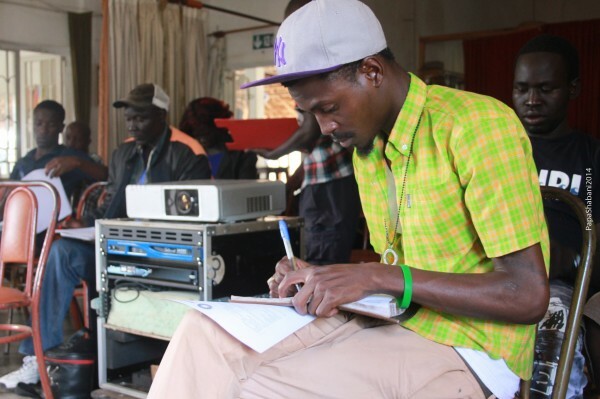 One of the questions the Gulu Arts Symposium attempted to address was how artists can get their music onto a festival stage. Alex Wasswa, one of the panelists emphasised that music at Festivals unlike other media, like radio, is not chosen on basis of its popularity but its quality. He has managed studios which has given him an idea on the expectations of artists, “An artist comes to the studio and he tells you that he wants a song on Friday that will be played on a concert on Saturday; do you think that music can compete with a song that has spent two months in a studio?” Alongside, the act of production the artist must also involve themselves in promoting their music. Another panelist, Sylvester Kabombo, a hip hop luminary stressed the need for artists to be prepared at all times with work in order to be ready for any promotional opportunities. Among them, that artist should specifically be ready with a written profile, photos, and any available documentation of press. The discussion also covered various avenues on social media — Facebook, Twitter, Soundcloud- where artists might share their work to boost their visibility. But there was a reservation that the artists were not using the social networks, and where they were being used, were not using them well. Among the panelists, Gregg Tendwa, a music manager and artist, familiar with both the concept of ‘cooking’ as well as that of ‘serving’, gave the most illuminating advice that bridged the two essentials. He thought that artists have an even better chance of promoting their music through interactions and forming relationships with DJs because they are a conduit between artists and their followers. An artist might play at a concert and if they are lucky they will get watched by some 500 people. DJs on the other hand might play a song in a club to 200 people three times in one week which was a way of multiplying the numbers. The relationship between DJs and local music has been a touchy subject with artists like Bebe Cool, most recently directing his fury at DJs for not playing enough local music. Should appreciation of local music and art in general be regarded patriotic? It supposes that local art — even the mediocre — should be ingested with a numb palate for patriotism’s sake. At the Symposium, Gregg Tendwa stayed clear of the political questions. Elaborating on the unity of interests instead, he remarked, “DJs are the direct marketers of music, they will promote themselves together with you; you are winning and they are winning.” Besides, professional DJ’s as producers can re-fashion sound into remixes that bridge the gap between artist and audience. At the festival, Acoli Muding was more emphatic. The backup band didn’t have his sound so most of it was improvised, inclining to more melodious reggae-influenced sound than to Hip Hop. In theatrical performance, the guitars lifted and strummed atop their heads. The first song was introductory with a refrain, “Kopa Ngo?” which is a greeting among the Luo, followed by another track that was a tribute to motherhood. Acoli Muding then engaged the audience with his sentiments, “Gulu, I want to challenge you people. How many of our artists have done this with our local instruments?” To demonstrate his point the band played a Ganda tune to which Acoli Muding danced Ganda-style with a cloth wrapped around his waist while rapping Acoli. He collected the first cheers of the evening and would leave stage with the impression that the withdrawn crowd might soon lighten up. 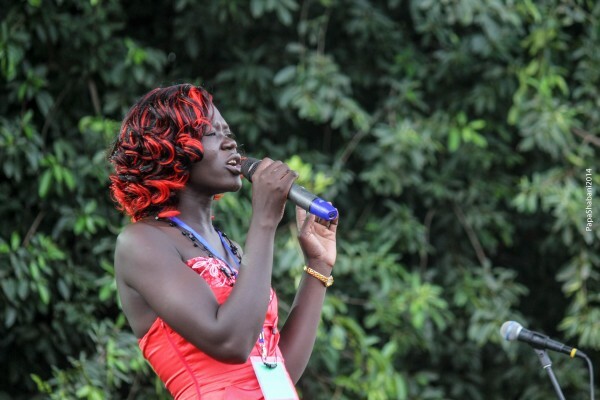 A young lady called Akello was elated to be talking to a visitor about the local music. Among the Luo, musicians are sometimes commissioned at weddings to compose tributes to brides at wedding. Sometimes these songs become popular and will send a specific wedding and its couple into posterity. It partly explains the popularity of love-themed music among the Acoli. The war has however, spurned another form of artist like Bosmic Otim, bringing to the forefront themes like reconstruction and domestic unity. Bosmic Otim performed on the last evening on the festival in a lineup that included Pamela Peace, the Golden Gate Band and John Oweka. The most anticipated appearance was Coco Finger, the region’s biggest musical export. The crowd pressed forward when Coco Finger was announced with the MC hailing him as the “Luo Ambassador”. He performed his first songs Party Animal, Stallion and My Miss comfortably. It was his rendition of Fred Maiso’s Ekimuli kya Rosa, which revealed the price of ‘big’ acts at festivals. Coco Finger had earlier commended the band for reproducing his sound despite their having not had time to rehearse would immediately raise doubts about his praise. After the band’s attempt at reproducing Fred Maiso’s original, he stopped them mid-track urging them instead to play a fast paced version. The sound that resulted was a clash of expectations, very emphatic but soulless. One other thing that stood out out was that the Luo Ambassador hardly performed any Luo. Leaving the festival, one ponders the showcases, workshops, stage performances and the general splash of the local arts colour. Perhaps the residue of such an event is the very notion that arts do talk. Too many conversations to document, yet somehow one feels the unique interactions of Gulu a little bit more.